Lionell Holmes, 6’3′, 190, 2-guard from the Chicago area, played one year at AVC as a freshman. Lionell was an academic qualifier and was recruited by Stephen F. Austin State University a D-1 program in Texas. Due to issues with his knees and his overall fit with the team, he decided transfer back home to Robert Morris-Illonois, a NAIA University in Chicago. 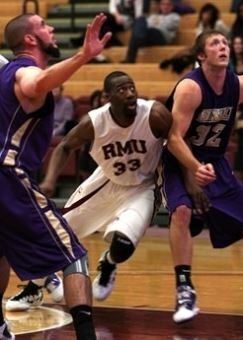 Robert Morris U was ranked #1 nationally in the NAIA polls nearly all year. Lionell will be a senior in the coming year and will compete his degree in computer sciences. When Lionell graduated from Stephen F. Austin State University, he enrolled immediately in the Masters program. After competing that degree, he played professional basketball in China. He currently is back in Chicago doing extremely well in the business world.